At Live True London Vauxhall and Nine Elms, we offer a range of waxing and threading services for both men and women. Quick, clean and precise, our waxing and threading services have been developed to be efficient and comfortable. Book your waxing and threading services online by clicking here or by calling our Vauxhall and Nine Elms salon on 020 7582 6312. Waxing is an extremely effective form of hair removal and can be used on virtually any part of the body. 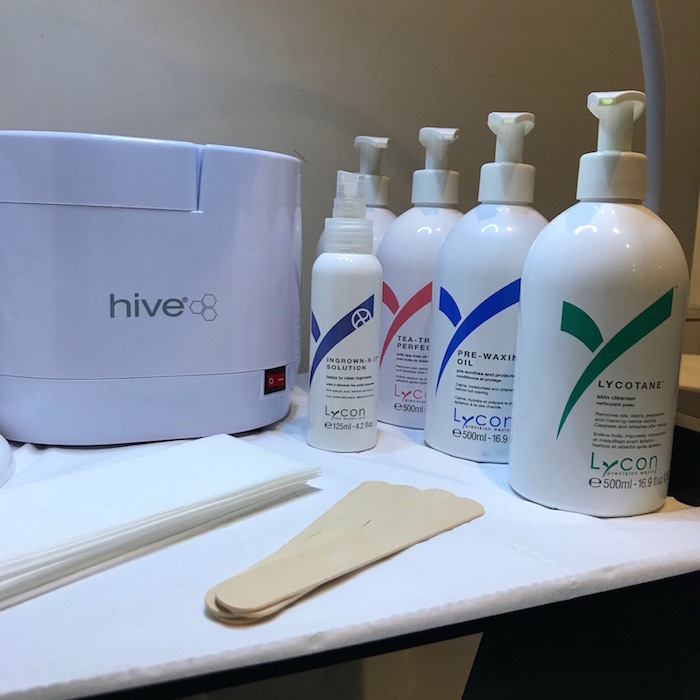 At Live True London Vauxhall and Nine Elms, we use only the premium Lycon Wax for all of our waxing services. Lycon Wax is made from a combination of pure Australian beeswax and soothing essential oils. It delivers superior performance by removing hairs as short as 1mm, needs lower temperatures for application (which means more comfort for our clients) and it’s conditioning oils provide a virtually pain free experience. Choose between yummy chocolate or apricot Lycon wax at your next appointment! Waxing packages are now available to purchase at Live True London Vauxhall and Nine Elms. Buy a package of 5 waxes and get your 6th wax free! Waxing packages are non-transferrable to another person and expire within 12 months of purchase. At Live True London Beauty, we offer our clients both strip and hot wax as waxing options. Your beauty therapist will know which type of wax is best on the area you have booked in to be treated. Strip wax is recommended for use on thicker, less sensitive areas of the body including arms, shoulders, back and legs. The process involves a thin layer of wax being applied to the area and removed using a paper strip. Strip wax is fast and effective and provides an extra strong grip and leaves behind no sticky residue. Hot wax is used to remove hair in more sensitive areas including the bikini line and face. The wax is heated and applied thickly onto the skin. The wax is allowed to dry onto the skin before it is then gently peeled away to remove unwanted hair. The heat of the wax opens pores reducing the likelihood of in-grown hairs and skin breakage. Our salon uses Lycon Wax – premium waxing products to ensure treatments are easier and virtually pain free. They are engineered to be creamy, gentle and soothing on sensitive areas. What’s more, the wax comes in fun colours and scents such as chocolate and apricot. For detailed do’s and don’ts, read our blog on Waxing Before and Aftercare Tips. Threading is a very effective way to quickly remove hair from the face and lip area for up to six weeks. Thread is twisted and swiped over the hair to remove at the follicle. This is the gentlest form of hair removal for the skin. Especially popular for eyebrows, threading allows for precision eyebrow shaping with incredible definition, leaving your brows perfectly shaped and symmetrical. Available at our salon in Vauxhall and Nine Elms, call 020 7582 6312 or click here to book online today.